A simple way to stay organized and create new habits is to become mindful of the things you add to your home and life. For each new item you add, decide to remove something old. So, if you add a new shirt to your closet, take out an old one. If you add an exercise class to your weekly schedule, subtract the equivalent amount of time from another activity such as web-surfing or watching television. This strategy can also help you stay focused on achieving a goal, organizing, or otherwise. Instead of working on ten new habits at once, pick one new habit that moves your life forward, and find a competing old habit to subtract. For example, you could add the habit of drinking green tea in the morning, and eliminate your mid-morning diet soda. Or add the habit of spending fifteen minutes a day decluttering, and shed the habit of waiting to tackle your organizing projects in longer, more laborious sessions. Now that’s an equation that works for me! How about you? What’s one habit or goal you’re trying to add into your schedule, and what’s something you can let go of to make time for it? What a SIMPLE and BRILLIANT idea! Would be especially helpful for runs to Target and the Dollar Store. I think I will count the number of new things I have just purchased, and then not unpack the bag until I have gotten rid of that many things! Ooh – what a great way to implement this idea. Love it!! This idea is really helping me develop a different mindset, especially about how I use my time. I shared it with a friend, and it was a revelation for her, too. In the past, both of us easily took on new things without thinking out which old things we were going to let go of. I have been mulling the concept over in my mind. And now I have a new mental picture for how I use my time. I’ve started thinking of my week like a picnic basket: one can buy beautiful picnic baskets with a little place for each item – I have always loved those. On the other hand, a picnic basket can be overfull, heavy, sticky and smelly. I like to think of organising my time like a puzzle – it’s not trying to fit in as much as possible, but finding the right place for the right item and having the most important stuff on hand to enjoy a lovely picnic. What great thoughts Joannie! Thanks for sharing them with us! I love the picnic basket analogy! Great article. thanks for the different perspective, i never saw that way before. We have so much goals we want to accomplish but we never accomplish are goals because are energy is not focused one specific goals. So for every new idea or goal, you should put aside any current ideas or goal to get proper attention. I’ve just started this but am sure it will help my life become less stressful! I think this is a wonderful idea. I need this so much. My stress level is too high. I need some organizing and one in and one out is GREAT!!!!!!! Thanks, Sharon!! 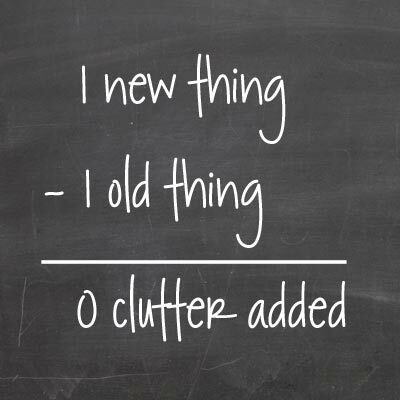 Decluttering will definitely help your stress level.